As a dedicated gamer, you spend countless hours lost in a virtual world. While you’re sitting, trapped behind a screen, you need to be as comfortable as ever to stay in the game. Posture and comfort are vital as you stay focused. Whether it’s competing in an online match, casually playing solo, or working on anything else, the chair you sit in determines the level of comfort you have and how long you can focus on the task at hand. The decision on what chair to buy is one of the hardest decisions to make. When looking at chairs, we immediately thought of 3 things: Style, Comfort, and Affordability. So, what kind of chair is out there that suits those 3 needs? I am a guy with many back problems, and the old wooden barstool was not suited for me. There was no support for my back, nor was I able to lean back and relax. It was time for something new. After the countless amount of reviews read throughout the chair industry, I struggled finding “The one.” Taking a second shot browsing, one brand caught my eye. Reading the reviews, the comfort was there, the style was there, and the affordability was right in my budget. Ewin Racing provided me with everything I was looking for. So, I decided to snag one of their Knight Series gaming / office chairs, and man, was I excited. After about 3 days, a massive package arrived at my door. It felt like Christmas in March, I was so excited. I was immediately astounded at how heavy the package was. It was known then, that this chair was going to be sturdy and well built. I couldn’t believe how well packaged the chair was. Everything was super protected to ensure nothing got damaged. Attached was a beautiful, laminated set of instructions that would walk me through about 20 minutes of easy assembly. They also provided me a nice pair of gloves! Once built, this monster stood out. It blew my mind on how good this gaming chair looked. One thing off my list checked, but does it fulfill my needs in terms of comfortability? Throwing the barstool to the side, this new beast took its place. As soon as I sat down, I immediately felt like I was thrown on a cloud, it was THAT comfortable. 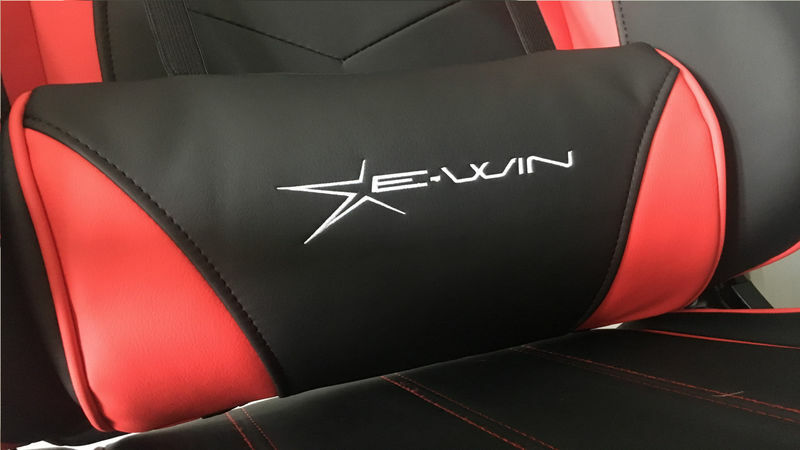 The Ewin Knight Series chair comes with a comfortable head pillow for relaxation and one well designed lumbar support to keep me upright. At any time, I can move the pillow and lumbar support or remove them completely to ensure 100% comfort. Nothing on this chair felt cheap. The adjustable arm rests were well built, as well as the actual frame of the chair. You can easily tell that this gaming chair was built with a lot of TLC. Great product for what you pay for. Arm rests are not padded. There is no wheel lock as I do roll around a bit. This review was not paid for, nor does TheTechGame gain any money off this review. Note: This is a review post from TheTechGame.